Does your front or backyard look the same as when you first moved in? Have you made any changes to personalize your yard and make it your own? Maybe it’s time to stop living in someone else’s design. With Spring soon to come, now is a great time to consider redesigning your yard to make it more functional for you. If not a total landscape makeover, then maybe just consider adding a feature or two that might entice you to spend a little more time outside this year. Here are a few ideas that you might be able to use in your own yard. One of the most functional, yet overlooked, features of a yard is a simple pathway. With many different materials to be made from (flagstone, gravel, stepping stones, concrete, etc.) a pathway can give you direction… literally… there are only two ways to go on a pathway. Other benefits might be: reduce tripping hazards (boulders, shrubs, curbing, etc. ), tracking less mud into your home, or maybe salvaging the lawn where excessive traffic tends to kill the grass. All of which are great reasons to consider implementing a pathway in your own yard. Now… where to put it? Having your own produce isle in your backyard can be a blessing in many ways. Not only will you be able to keep a little more green in your wallet but you will also be able to put a little more green on the table. And if that doesn’t interest you then consider the psychological benefits a garden could offer. Studies show that working in the garden can reduce stress and tension, and provide a little bit of exercise which is all good for the body. You can literally live happily on the “fruits of your labor”. There is no shortage of sunlight here in Kern County and one way to escape the sun and its deadly rays is to put in a shade tree or two. A shade tree can be any tree that provides shade regardless of what kind it is. A shaded yard can be much more appealing as it’s not only cooler, but it brings in the wildlife that can be quite interesting to watch. A well manicured shrub can offer many different benefits to go along with its apparent offering of green growth. In some instances a shrub can hide yard utilities such as pool pumps, sprinkler valves, and even a shed if mature enough. The right kinds of shrubs can be made into a topiary of animals or objects that can be quite enjoyable to create and look at. Another great feature for any backyard is a patio. Most homeowners have a patio that adjoins the house, is made of concrete and has some sort of structure that covers it. But what about something a little more natural and not quite so close to the house. By installing a flagstone patio somewhere in the yard you create for yourself a sort of retreat. Imagine a destination that can’t be seen from the house (maybe because of overgrown trees and bushes) that allows you to escape the chaos, distractions, and stress of your every day life. Of course no backyard would be complete without some type of water feature. 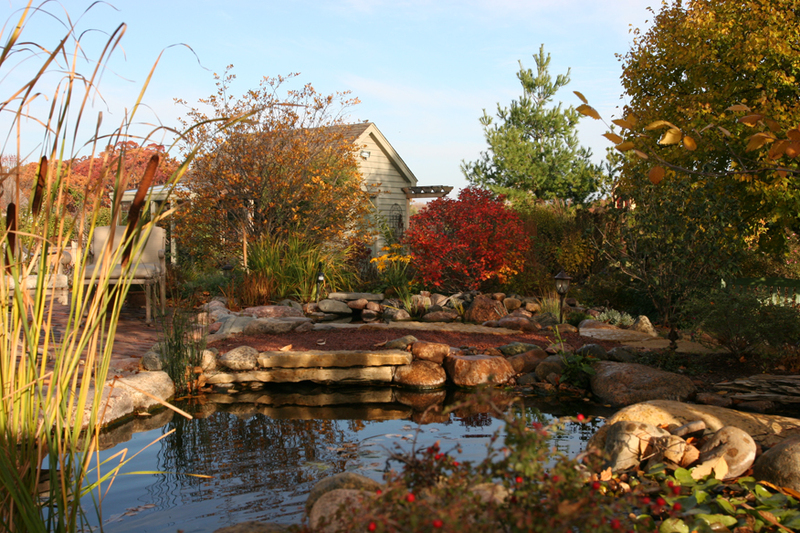 A pond can offer so much to the backyard life. A waterfall is not only pleasing to look at but can be soothing to hear as well. Once you’ve been enticed out of the house by the view, you will remain captivated by the soothing sight and sound provided by all the life that comes with the pond environment. Fish will greet you with smiles and pleas to be fed. Dragonflies will swoop in to rest and grab a drink. Frogs and crickets will serenade you with their beautiful music. And the plants… well… if you’ve got a green thumb now you can have a wet green thumb. The aquatic plant blooms can be absolutely stunning.